VANCOUVER, British Columbia -- After failing to score on his first three tries in a shootout, Damon Severson came finally broke through for the New Jersey Devils. Pettersson broke out of a scoring slump with a power-play goal to open the scoring at 3:18 of the second period. With Stafford off for tripping, Petterson took a pass from Brock Boeser and ripped a shot from the faceoff circle over Blackwood's shoulder. It was his first in 12 games and gave the 20-year-old Swede 59 points on the season -- a team-leading 27 goals and 32 assists. He is one point behind Pavel Bure and Ivan Hlinka for most points in a season by a Vancouver rookie. Vancouver also scored on a power play in Wednesday's win over the New York Rangers. It's the first time since November the Canucks have scored on the power play in back-to-back games. ... Canucks F Jay Beagle didn't take the pregame skate and was replaced by Tim Schaller. ... 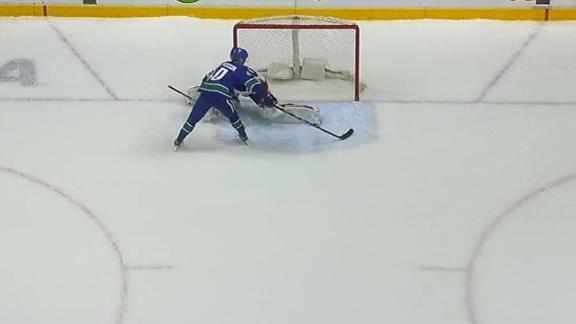 The Canucks didn't get their first shot on goal until almost 6:30 was gone in the opening period. . Before the game started, the Devils were eliminated from playoff contention when the Columbus Blue Jackets defeated the Carolina Hurricanes 3-0. New Jersey is 14th in the Eastern Conference. Elias Pettersson scores with the patented Peter Forsberg move in the shootout, but Damon Severson's goal hands the Devils a 3-2 win against the Canucks.